2017 Kitchen Remodel | RB Schwarz, Inc. 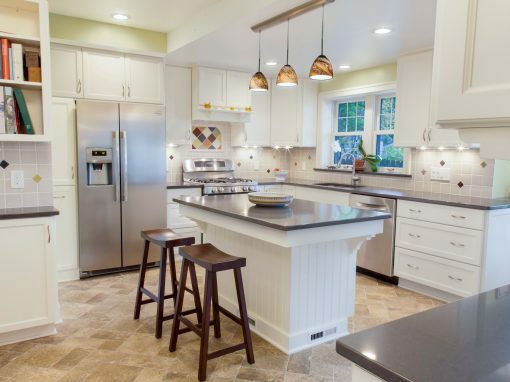 The homeowner was motivated to remodel her galley kitchen because of design, restoration and layout issues. 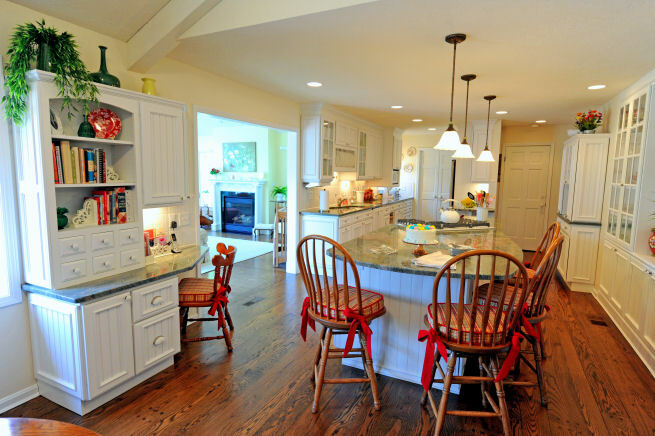 Aside from dated cabinets, a previous 1980s remodel had created awkward angles in the space, which needed to be removed to honor the wide galley kitchen. Also awkward was the back entrance, which was redesigned to incorporate the porch into the kitchen space, allowing for more room, more light and more cabinets. R.B. 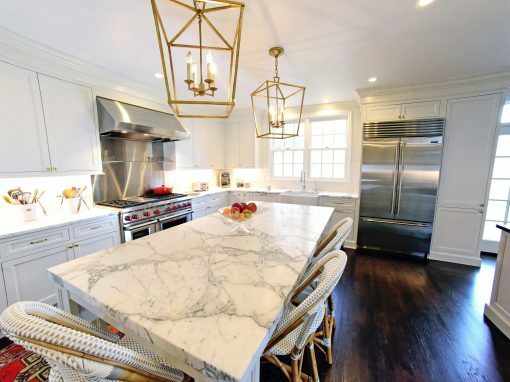 Schwarz Inc. created a beautiful kitchen with details such as custom arch casings, moldings and white oak flooring that fit with the original style of the 1916 home. This 1916 home had an awkward back entrance, a short galley kitchen, and a butler’s pantry separating the kitchen from the dining room. R.B. 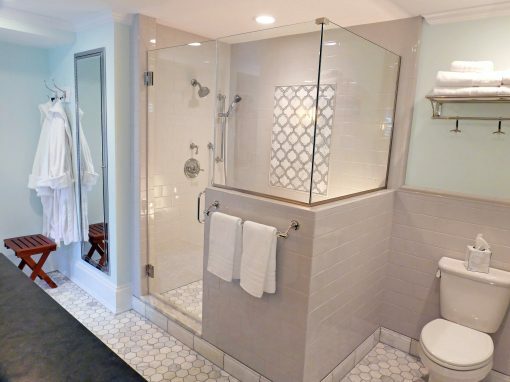 Schwarz Inc. utilized every inch from floor to ceiling and demoed a laundry closet to create a new back entrance. 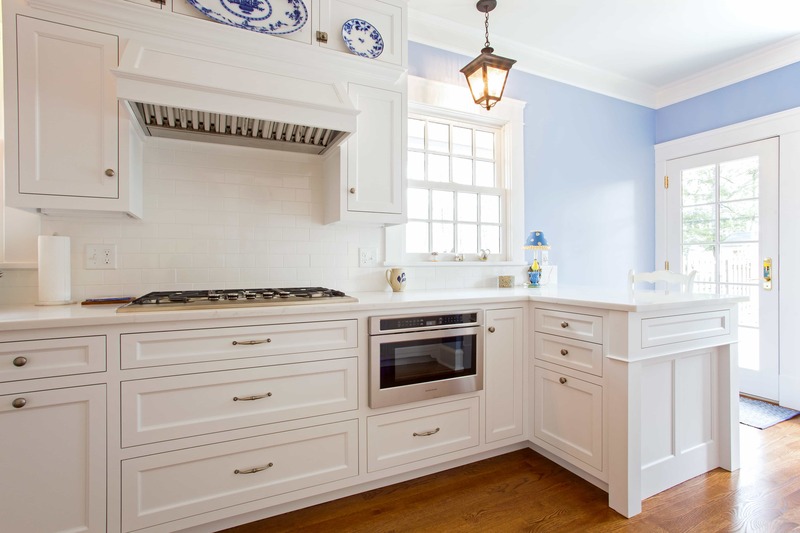 Our clients love for her blue and white china inspired the color palette for this kitchen remodel. The coach-style lantern pendants give a nod to 1916 carriage lanterns. 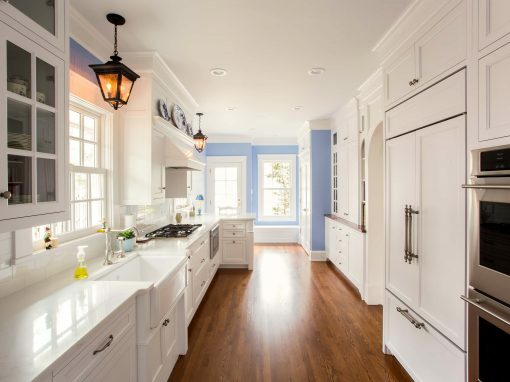 The cabinets are balanced in the space by three windows, a closet door, three openings — the breakfast room, the dining room and the butler’s pantry — and the true divided lite that fronts many of the cabinets. “That glass means it doesn’t feel closed off,” says the client. “It shimmers, it shines and it reflects. 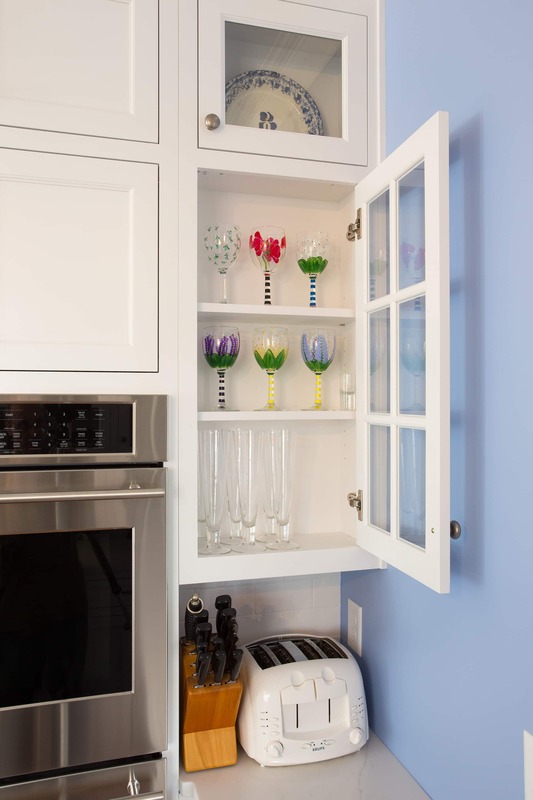 You can look through the glass to whatever is in there.” Not only are the cabinets custom, but also the backsplash tiles, 3-piece crown moldings, and hardwood floors. 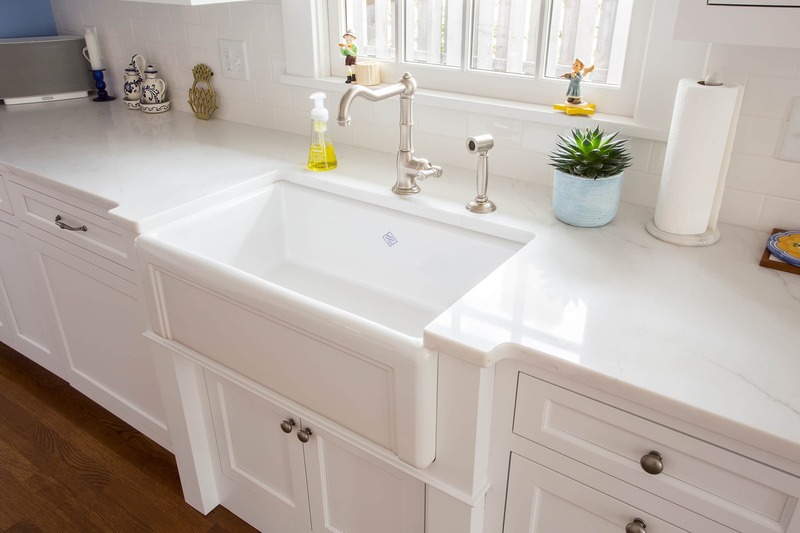 The Shaw sink is a white apron sink, sometimes called a farmhouse sink. 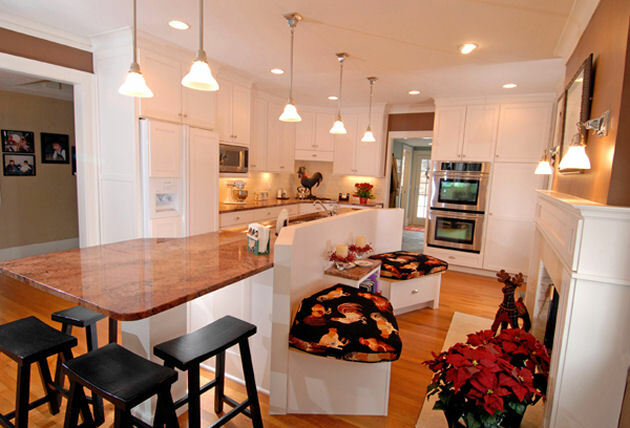 It is undermount below engineered quartz countertops that mimic marble. And the sink is finished with a Rohl country kitchen faucet and sidespray. The cabinets above the hood (and behind the china displayed on the plate rail) feature a latch that is an original style for the 1916 home. 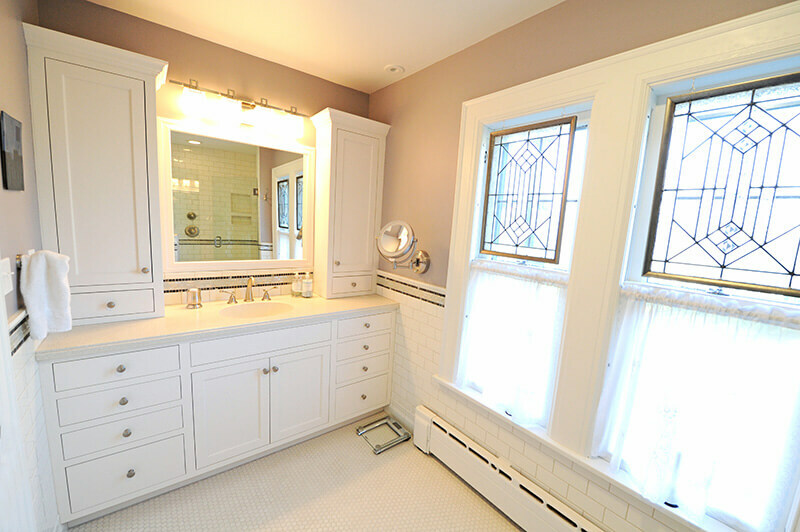 The cabinets are custom built with Shaker style inset doors and drawers. They feature old-school hinges and modern full extension drawer glides. 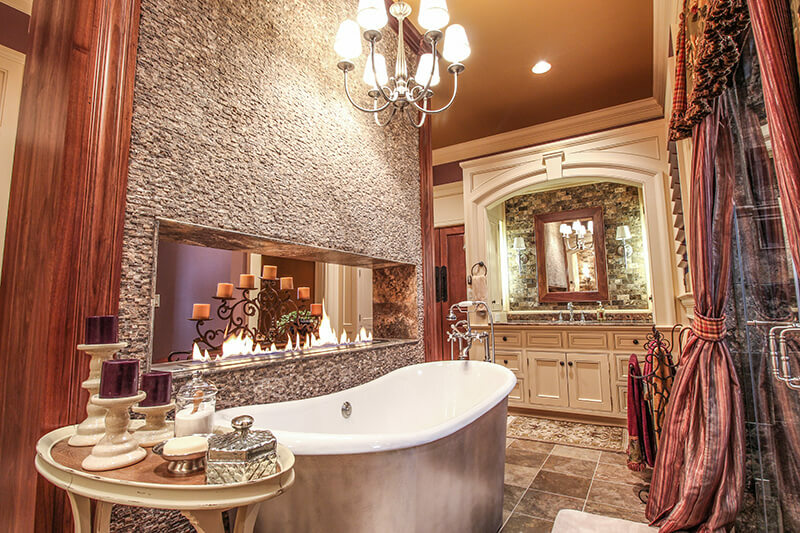 The cabinet hardware is pewter to match hardware throughout the home. 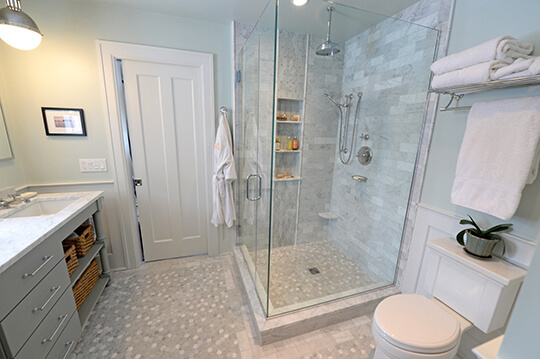 The 3×6 white subway tile was handmade in California. 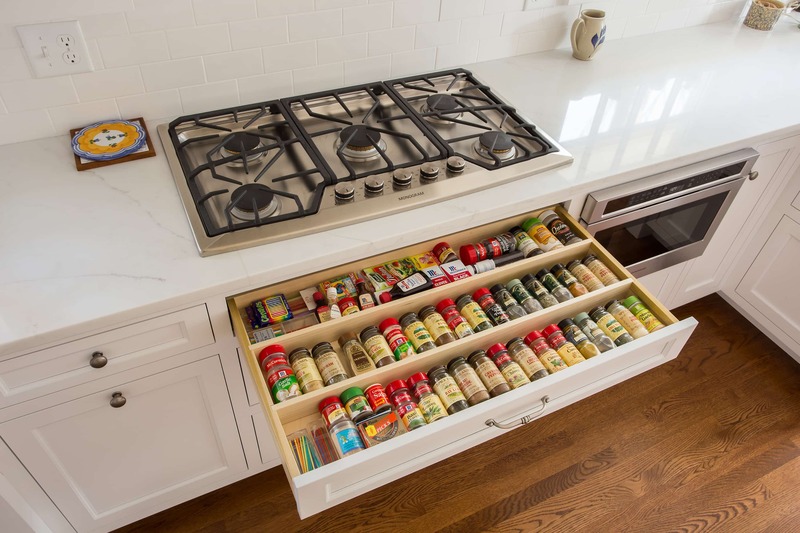 The spice drawer is conveniently positioned under the Monogram gas cooktop. It holds 54 spice jars in its full extension drawer. 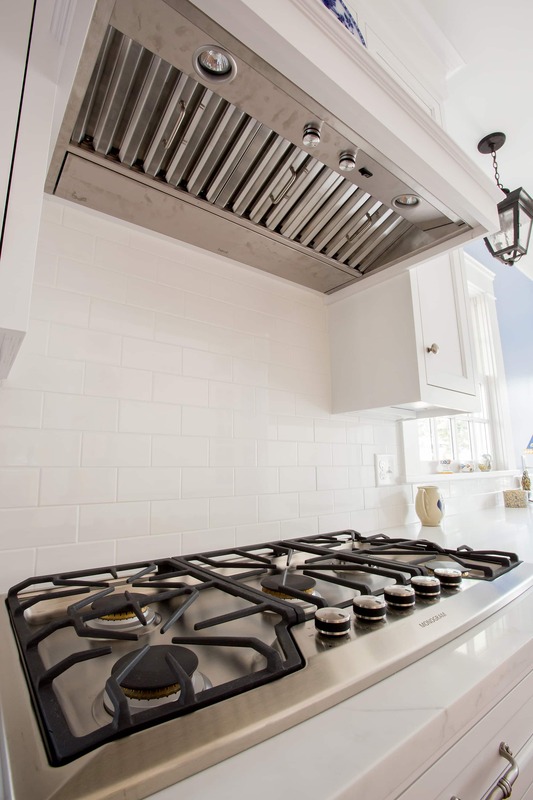 This cooking wall features a GE gas cooktop and BEST hood. The drawer microwave is a modern convenience in this 1916 house. 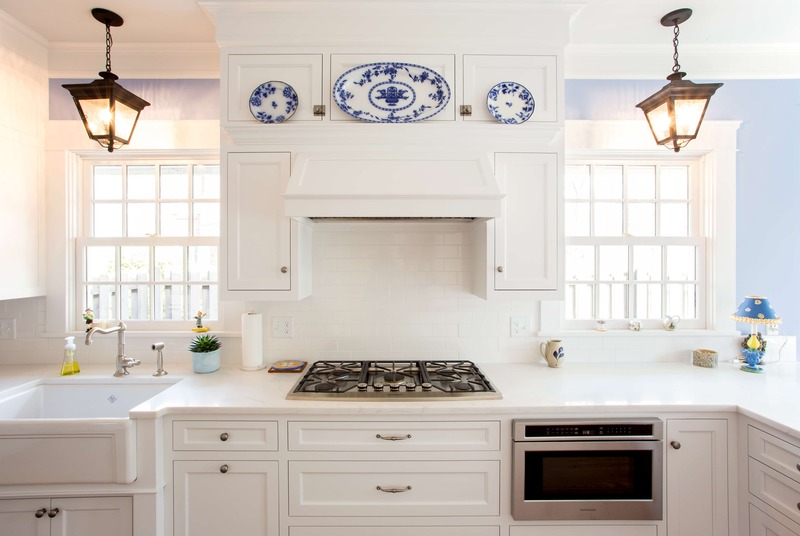 The BEST hood is mounted under a wood surround with crown molding to match the cabinetry and a plate rail to display china. And the backsplash is 3×6 white subway tile, handmade in California. 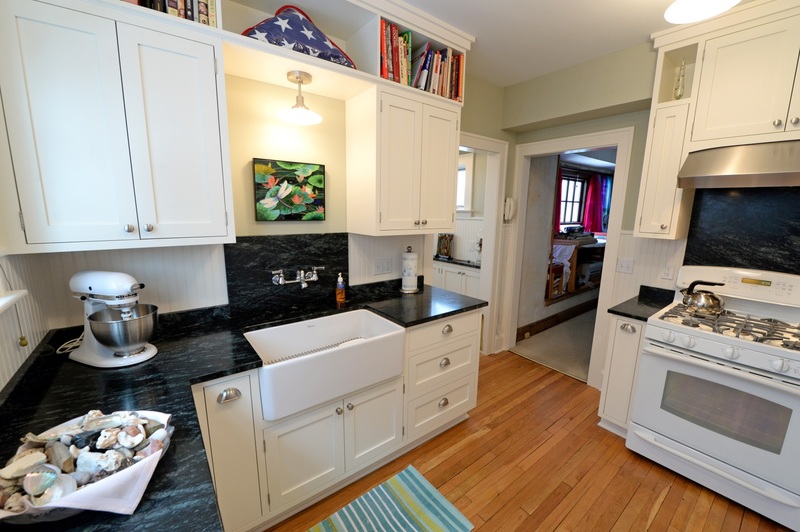 This 1916 galley kitchen boasts modern Monogram gas cooktop and a BEST hood. 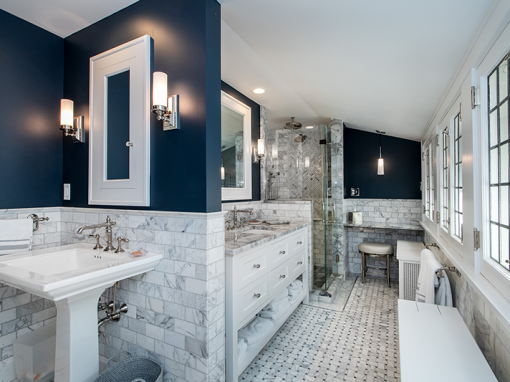 The backsplash is white subway tile that was handmade in California. 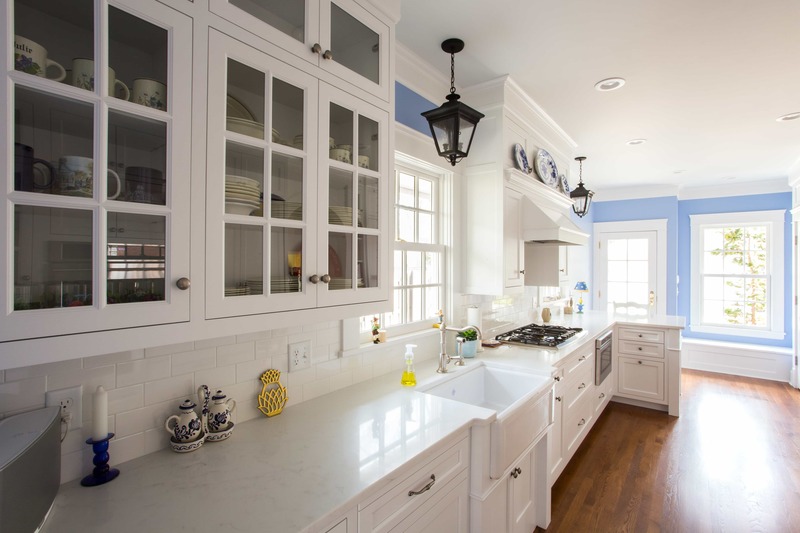 The kitchen redesign was a continuous play in balancing classic with modern. The formerly awkward back entrance was redesigned to incorporate the porch into the kitchen space, allowing for more room, more light and more cabinets. With this small addition, the kitchen and back entrance now reside in harmony. R.B. Schwarz Inc removed the washer and dryer closet to make space for bench storage, a new window, larger closet storage and a new back entry. 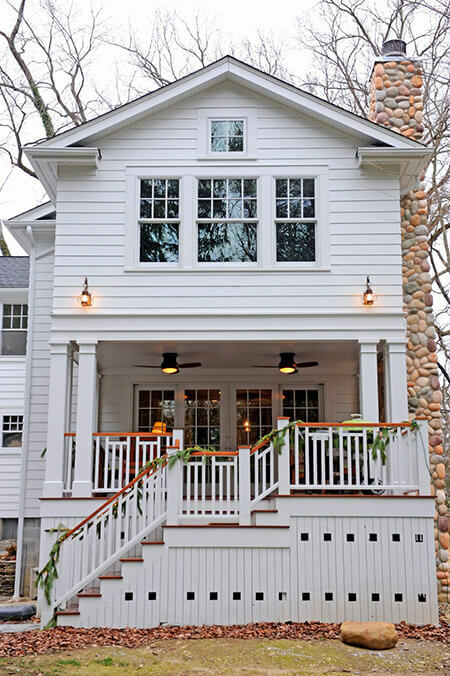 The entry door was moved from the side wall to the back wall, made possible by reworking the headers and incorporating the porch into the entry space. The custom built bench opens for more storage. The closet has rods for coats on the interior and glass Emtek knobs on the exterior. 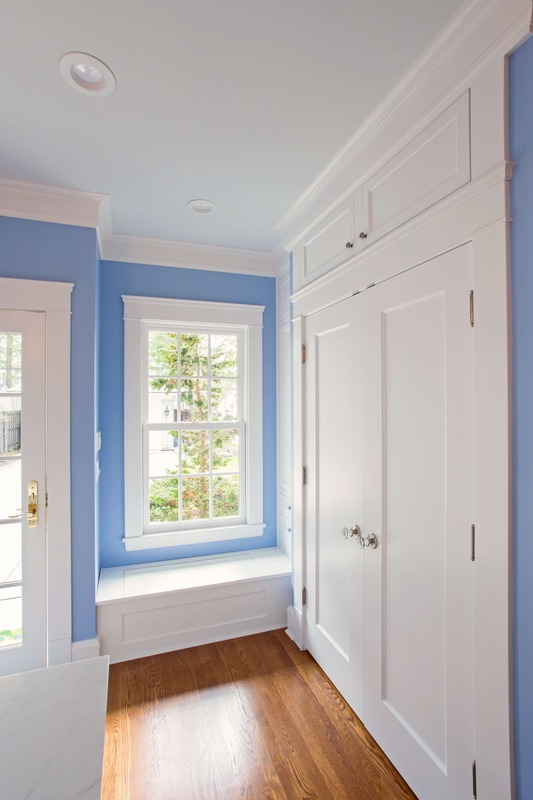 The flat panel closet door emulates the 1916 style of the house. 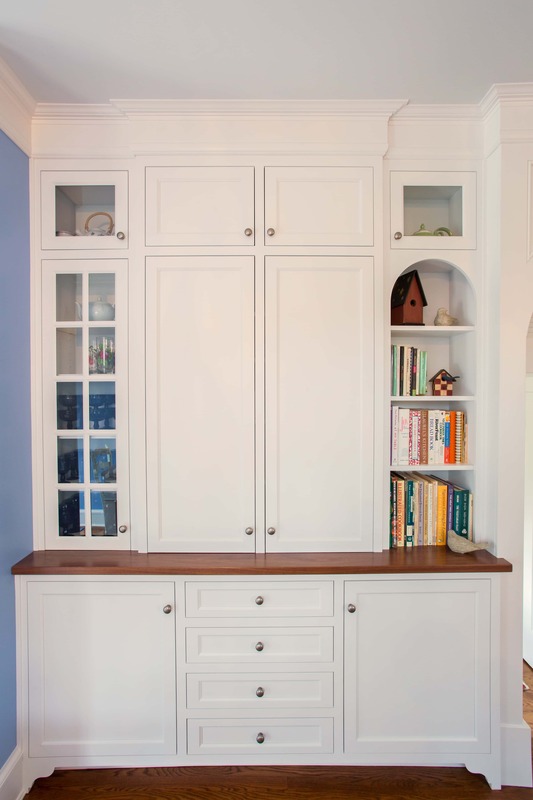 This custom built-in hutch has so many details: true divided lite glass doors, detailed furniture feet, walnut countertop, pewter knobs, arch casing bookcase, and 3-piece crown molding. This crown molding installed throughout the kitchen was milled locally in Ohio to match the original moldings found throughout the house. 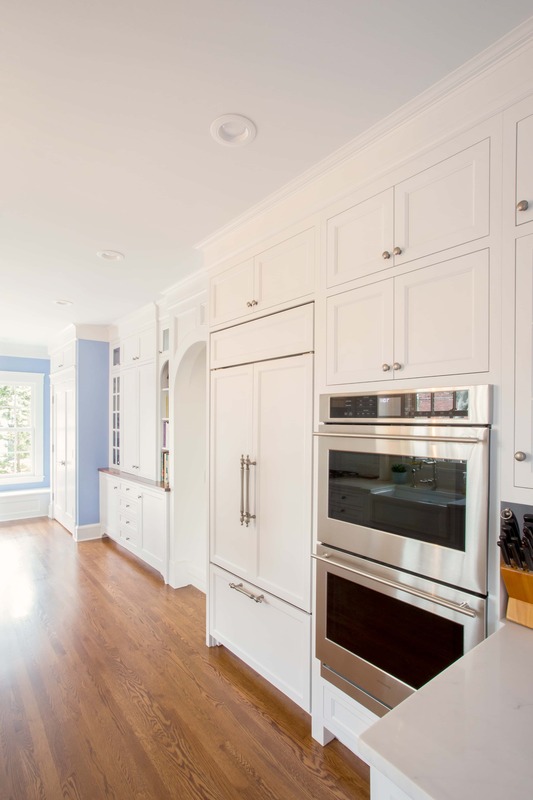 The Subzero refrigerator blends into the custom cabinetry surrounding it. The double ovens are GE appliances. The back entrance features new Marvin windows and door. Cabinet hardware is pewter. And the white oak floors match the original flooring throughout the home. 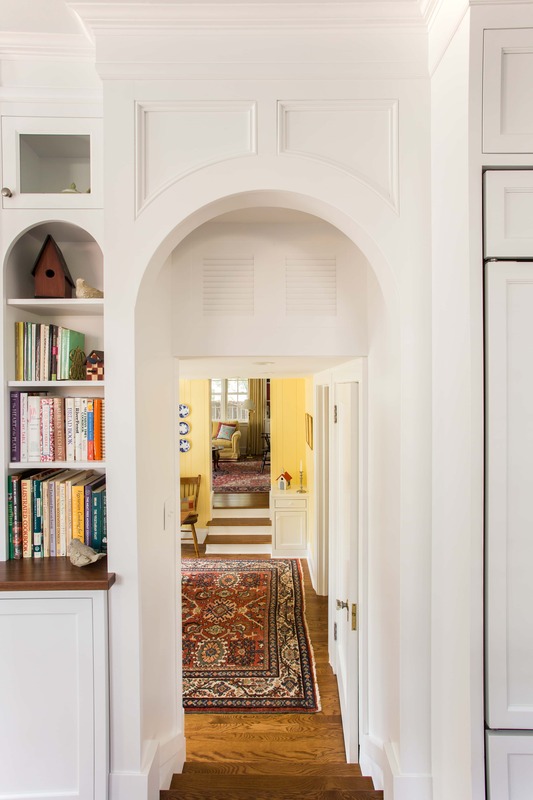 This beautiful arched hallway casing was custom built by R.B. Schwarz Inc. There is custom carpentry in the arch, in the moldings, in the panel to hide the heating duct, and in a small pair of shutter to allow intake air for the HVAC. 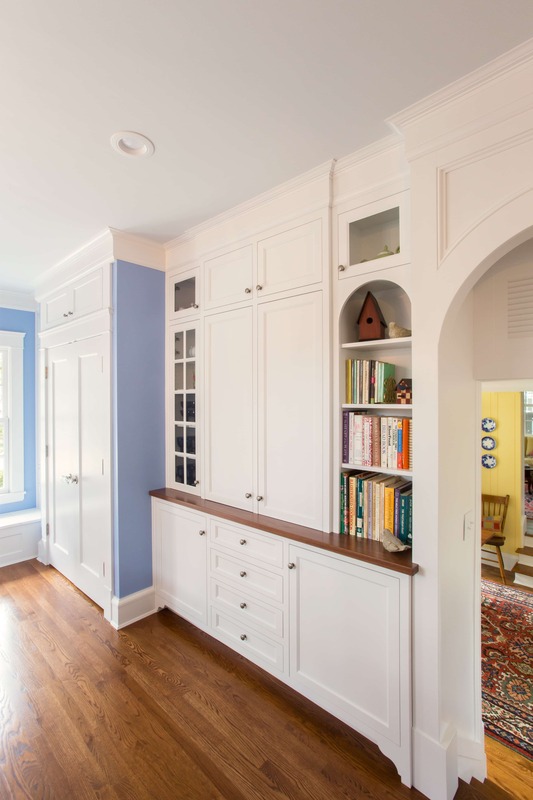 The design of the bookcase in the hutch mimics the arch cased opening in the hallway. Many of the cabinets are true divided lite glass doors. 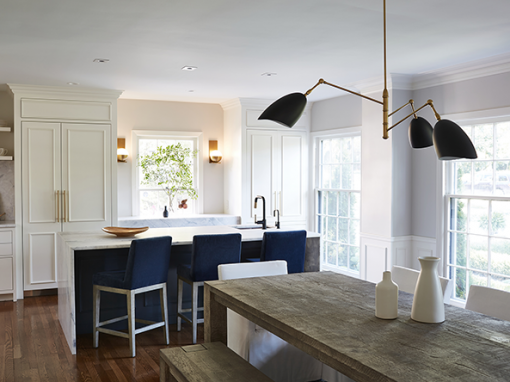 The existing sleek-faced, laminate cabinets were replaced with custom-built cabinetry that kept true to the home’s time period and to the cabinetry in the remainder of the house. “We make the cabinets from scratch because everyone wants to maximize space,” says R.B. Schwarz. 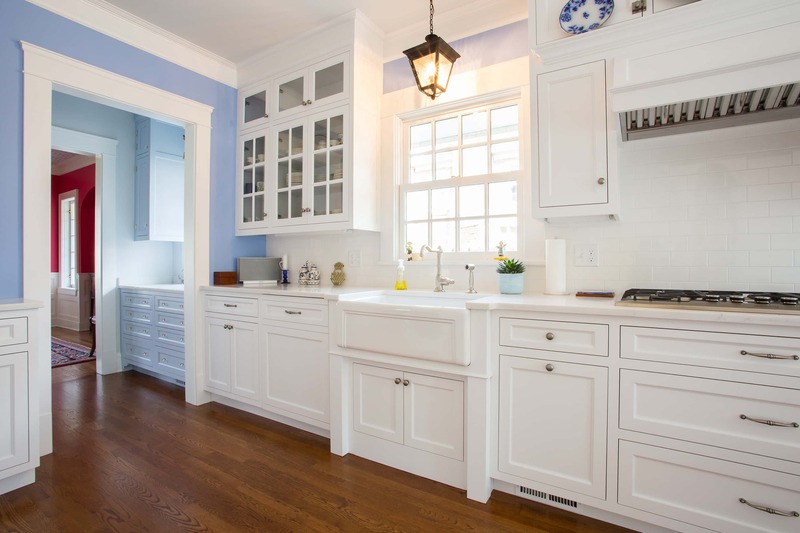 To further their authenticity, the insides of the cabinets were painted which helps them appear original to the house. 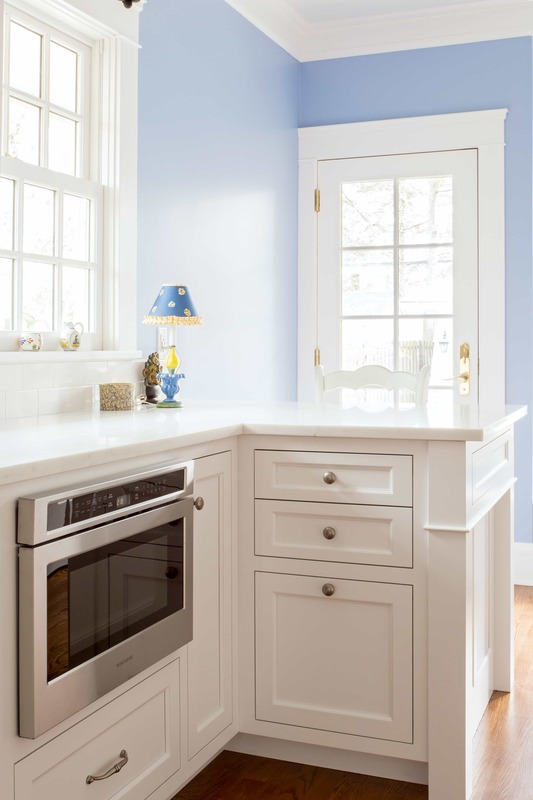 The white cabinets pop against a bold blueberry blue on the walls and a soft blueish gray on the ceiling, which carries through to the butler’s pantry ceiling. 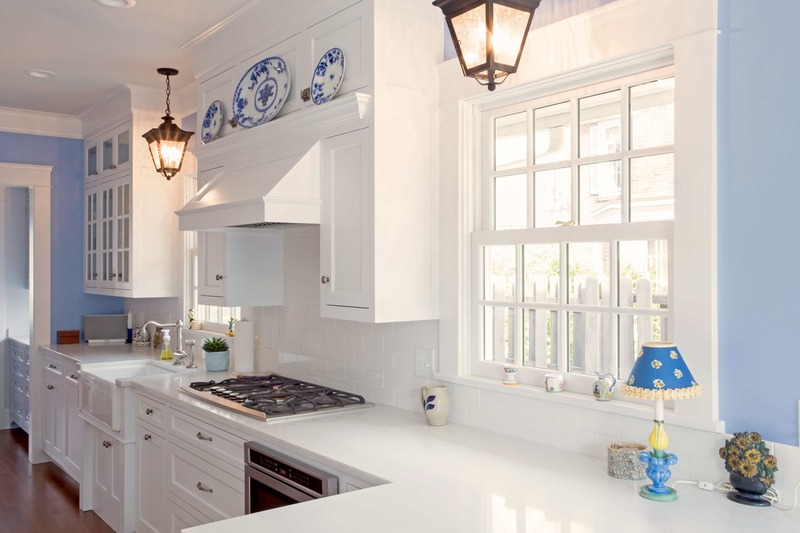 The elegance and sophistication of the kitchen and pantry is played up with glass cabinet knobs which can be found in other areas of the home, as well as antique pewter drawer pulls and knobs that blend well with the gray and blue color palette. Engineered quartz mimics marble on the countertops and the previous floor tile was pulled up to return the space to hardwood floors. This lovely butler’s pantry bridges the kitchen and dining room. 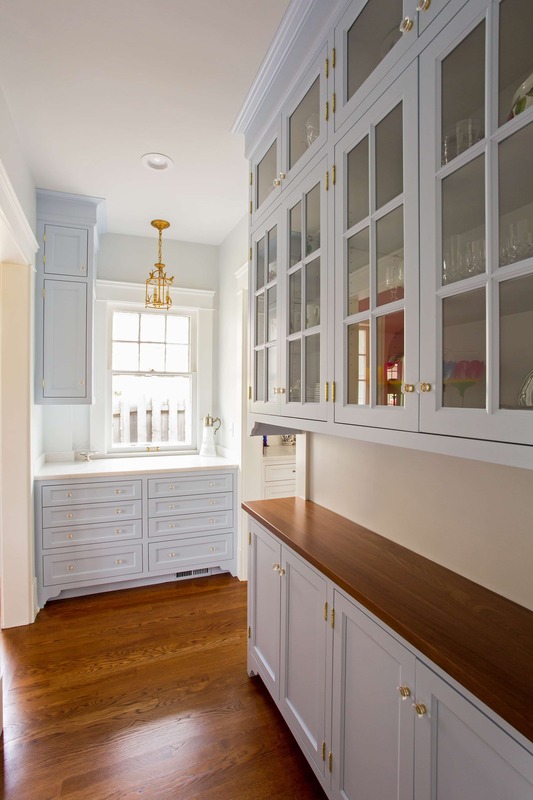 The custom cabinetry is not deep and mimics the look of a china cabinet with furniture-like details. The cabinet glass is true divided lite glass doors. 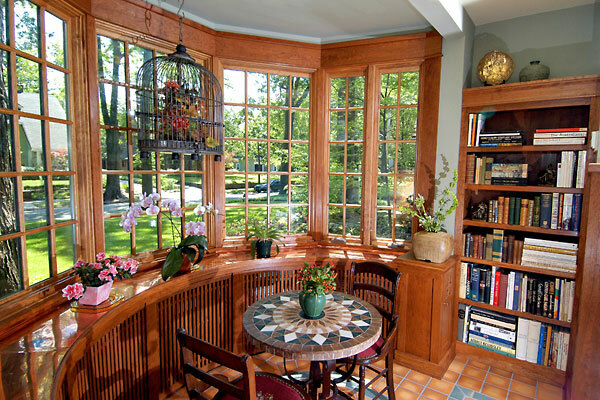 The cabinetry under the window is full extension glider drawers and Emtek glass knobs. Beautifully ornate birds sit on the brass chandelier reminding you of a bird cage; it is a replica of a period light fixture.